Some jobs GP Electrical and Plastering do are from people that have seen our business card in their local shop. 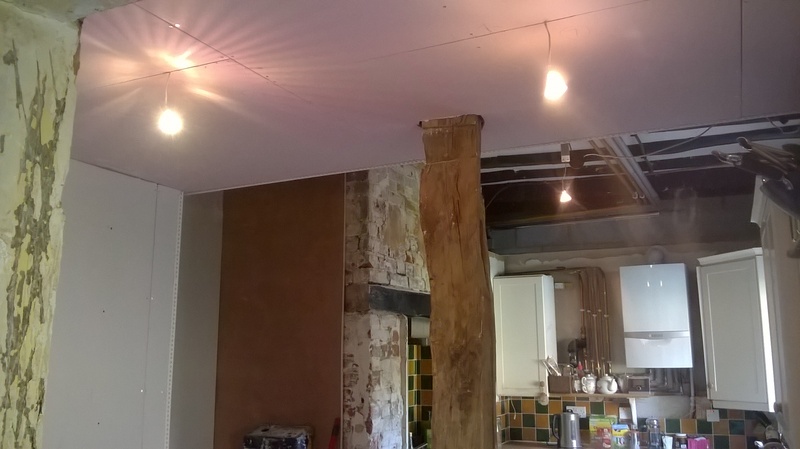 Others are regular customers that always use Gareth whenever they need an electrician or plasterer. Others even go a step further and have him almost as their personal tradesman, calling upon him for work to their home, to their business and even for their business. One such customer is Martin who boards his dogs at Gareth’s parents kennels, calls on us any time one of his carpentry customers’ needs electrical or plastering work done, has slowly and surely been getting his whole house revamped and has also drafted Gareth in to build partition walls at his company offices. His most recent request was for a factory chic style renovation to his kitchen. This is part of ongoing work throughout the house. 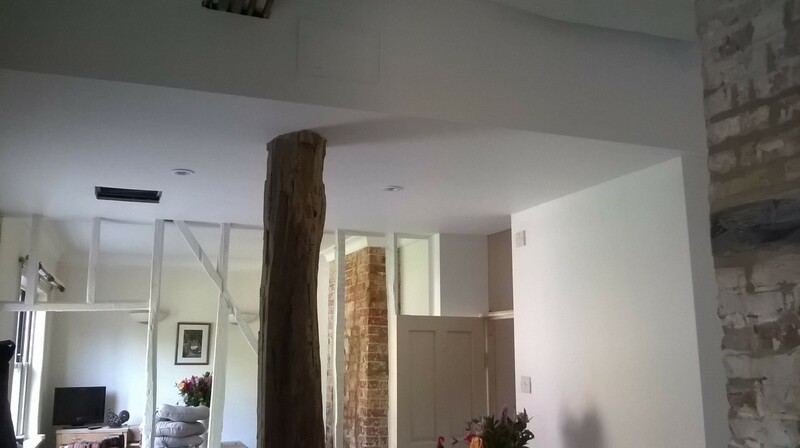 This project saw Gareth install a metal-frame drop ceiling, under-floor heating, cove, uncover 1 fireplace and plaster another. 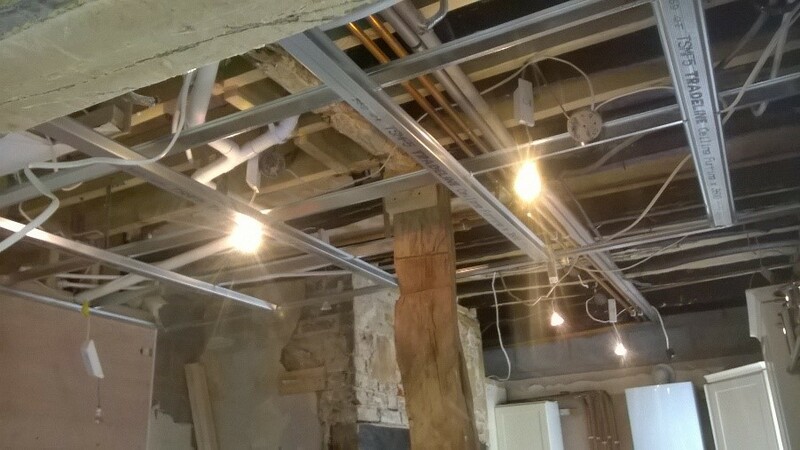 Originally the central ceiling was a mess of exposed pipes and cabling, so the first job was to loosen off the existing lights in order to carry out work around them. 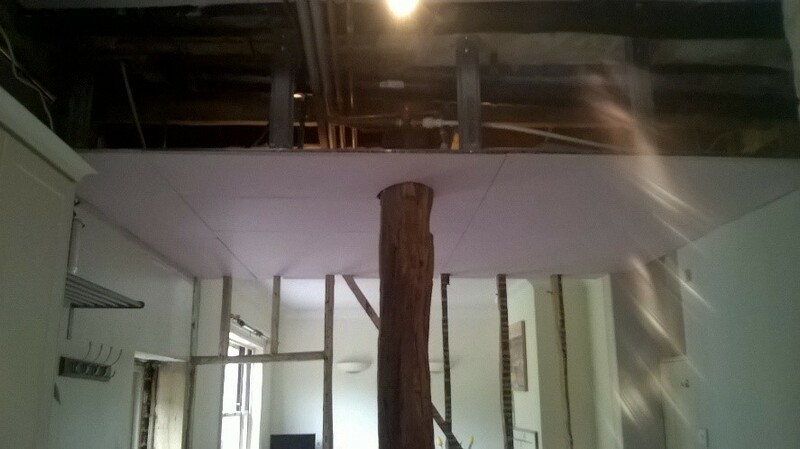 Next Gareth constructed the metal framework for the ceiling and fixed it in place. 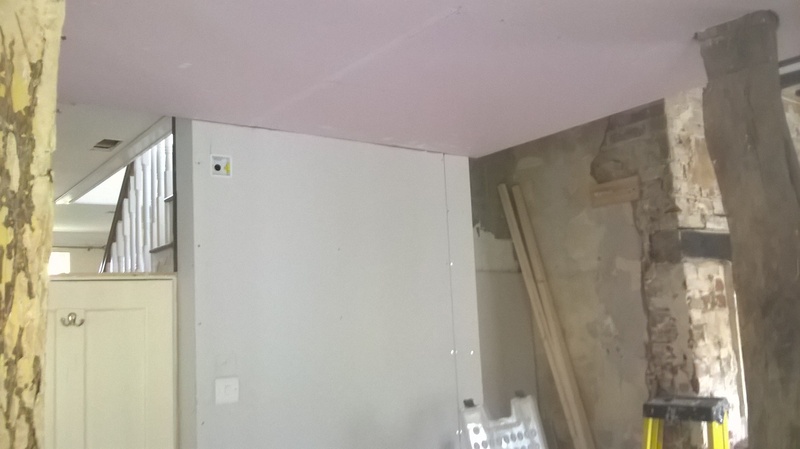 At this point there were wires everywhere, so he had to be very careful and tidy them up before the plasterboard could be screwed on. 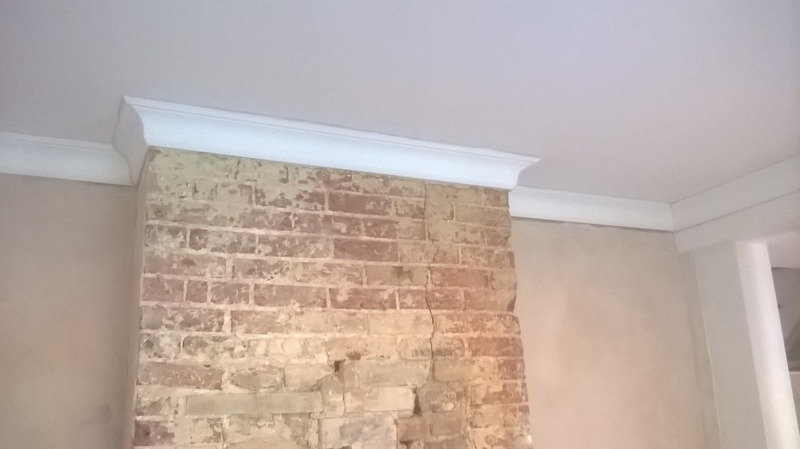 To finish, Gareth applied 2 coats of plaster and worked it until it was beautifully smooth, ready for painting. 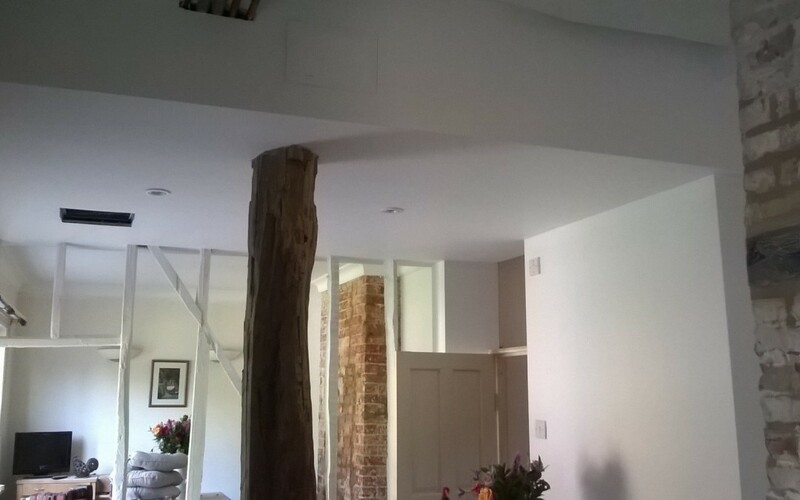 The ceiling at the other end of the room was originally exposed dark wood beams with messy cable running between them, which required the crumbling areas between the beams to be re-plastered, the cabling run in galvanised steel conduit to match the factory chic style and both the plaster and beams painted over. 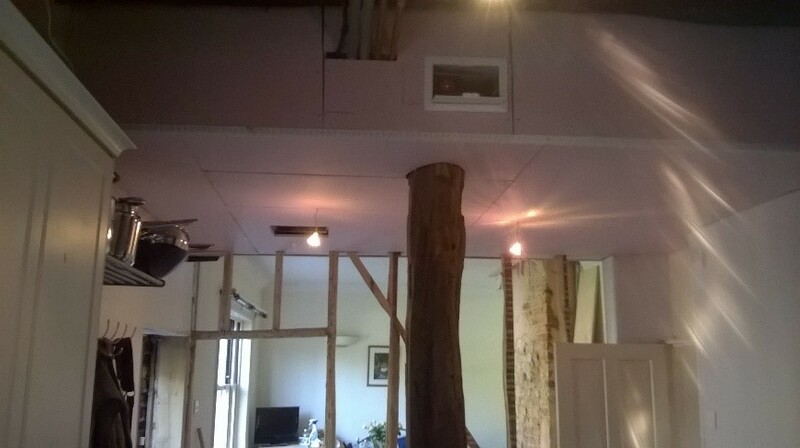 Although Martin and Caroline wanted the fireplace at the drop ceiling end of the room uncovered and coved (shown in ceiling photos), they wanted the fireplace at the beamed end plastered over. 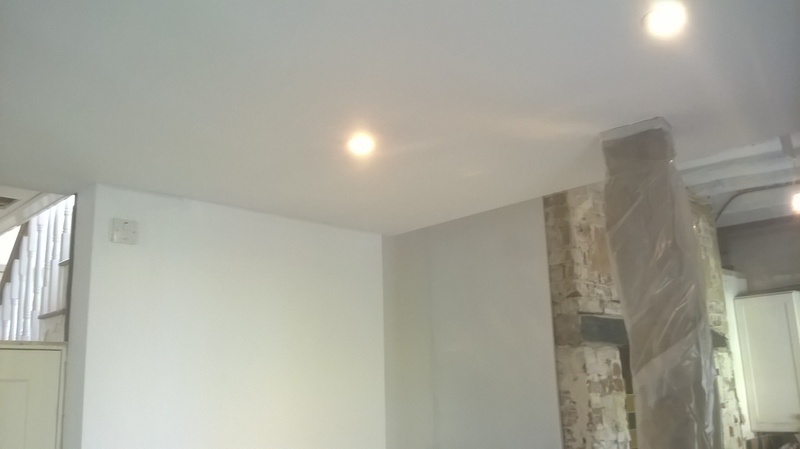 This was the quickest part of the job as it only required undercoating and plastering a small area. As well as the wall, the area in the fireplace alcove was required to stay at its current level, so before Gareth started floor work, he built a low barrier around the fireplace to stop the levelling compound running in. 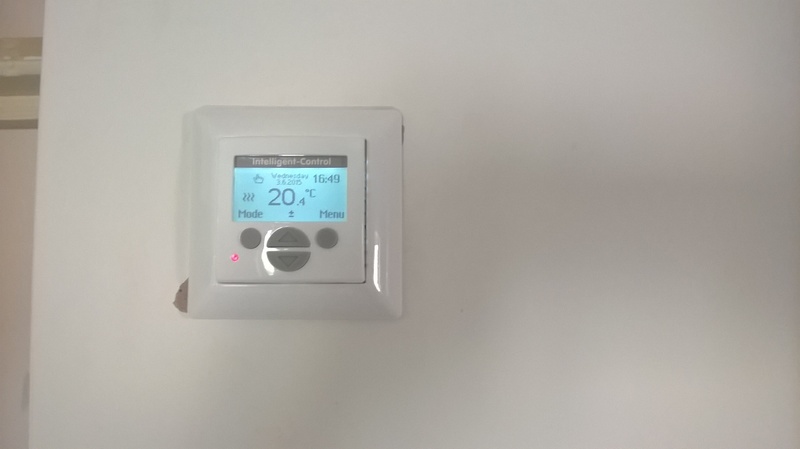 As Gareth had boarded the wall to the left of the hall door, the wiring to the underfloor heating was able to run in the gap behind this, as was the wiring from the heating pads to the wall mounted thermostat. 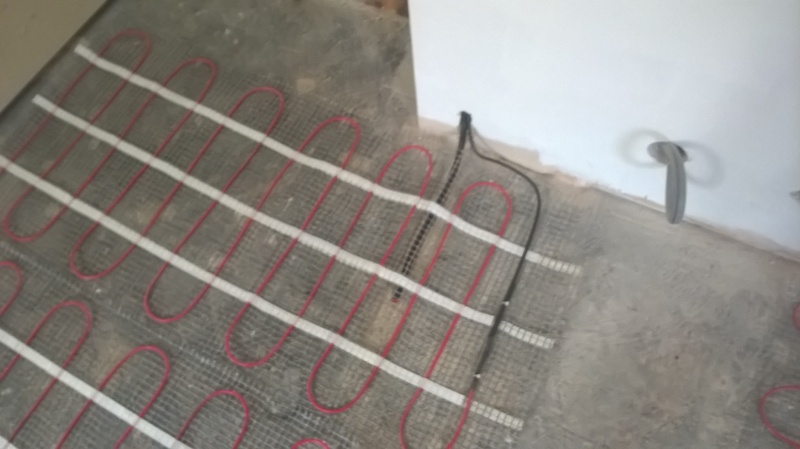 The pads are self-adhesive, so attached easily to the floor once laid out. 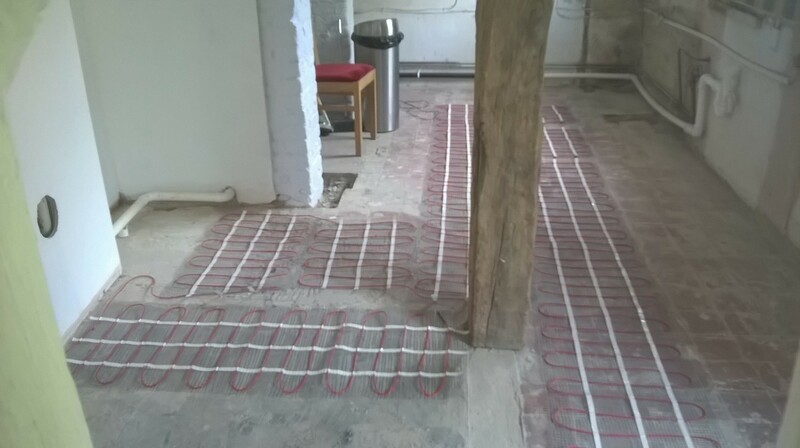 Once tested to ensure the heating was working correctly, the beams and any other exposed areas that needed to be protected were covered. Normally our plastic sheeting is used to protect customers’ carpets from powdery footprints, but in this instance our wonderful little multi-functional sheets doubled perfectly as a thick covering to prevent unwanted areas becoming ‘floored’. 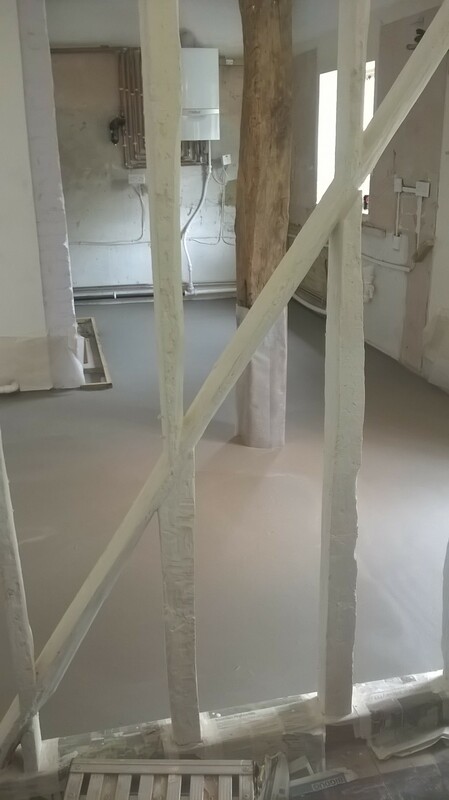 After ensuring the fireplace barrier he had built a few days earlier was secure, Gareth mixed and poured the levelling compound onto the floor. The next step was to remove any air bubbles, by running an aptly named spiked roller over the floor. 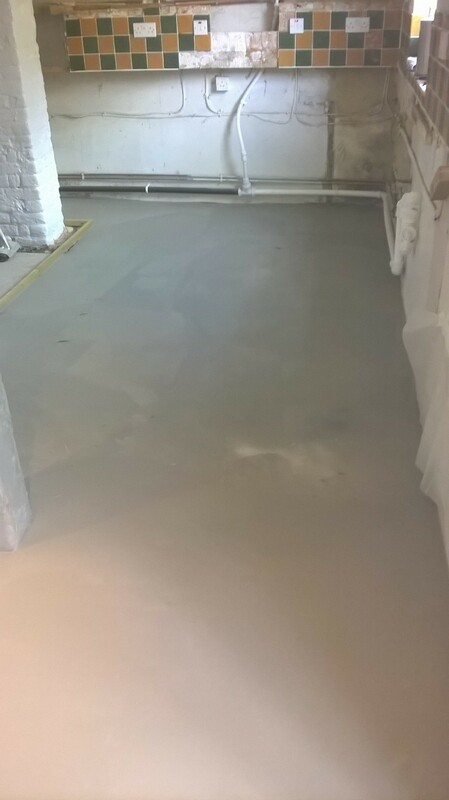 As the floor was so uneven, a second layer was required and then this job was complete.